Please feel free to have a look and let me know what you think. 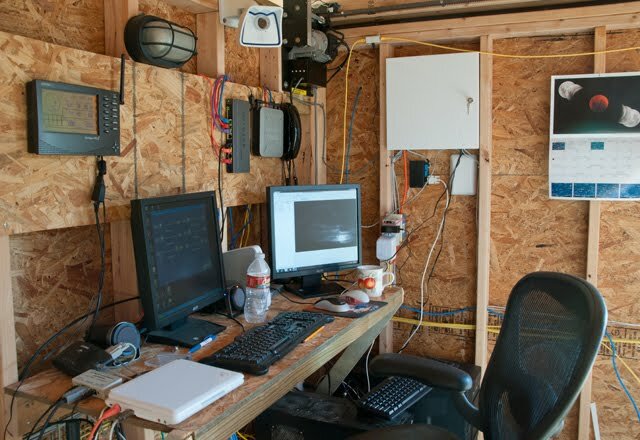 There are still a few dead links, but it is mostly all up. Hopefully it will be 100% soon. I intend to continue to use this blog for news events, etc. But check out the gallery at BuckSnort for all the latest images. I have imaged a lot of targets over the last few weeks (thank you clear skies)! As such, I have a backlog of data I have been processing. I like these problems. Here is a 4 panel mosaic from the constellation Lacerta that features Sharpless 126 (the red nebula) and a plethora of smaller VDB and LBN objects. 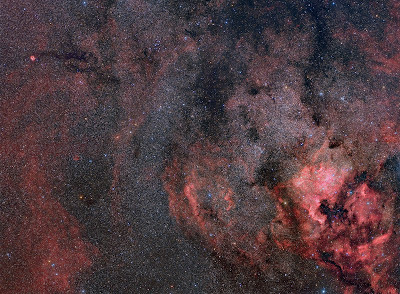 Here is a 3 panel mosaic of the Eagle Nebula, Swan Nebula, and Barnard 92 near the heart of our Milky Way. 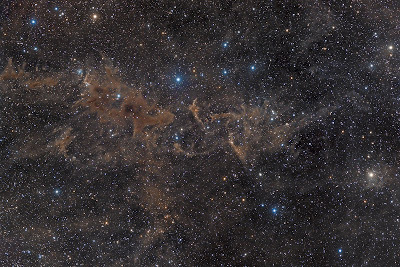 This dusty vista around Cepheus is centered on LBN 552. If you look closely, you can see a dusty "obscene gesture" ...heh, heh. Last Friday July 8th I finally realized a dream and attended my first (and last) Shuttle launch. I just barely made it. Atlantis is the last Shuttle to fly... ever. 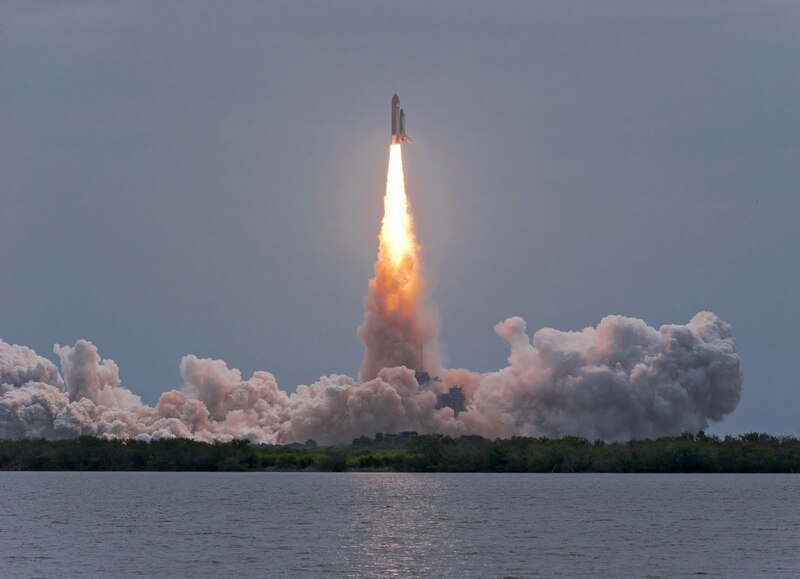 The Shuttle program had promised to make space flight routine and common place. It actually worked too well -- many Americans stopped being impressed and/or paying attention. And I too admit to procrastinating up until the very last flight. In fact, if it wasn't for my friend John who works at NASA, I would not have been given the chance. But last week, Kim and I were invited to view the launch as NASA VIP guests! It was indeed an exciting 2 days. On Thursday, we attended a briefing and were given a tour of the pad (bussing up to the infield fence, right next to the pad itself). Then on Friday, we were taken to the Banana Creek viewing area, the same area from which the astronaut's families view. And the launch was spectacular! It was also bittersweet. Since this launch brings the Shuttle program to an end, many of the NASA personel who stood and cheered are transitioning into other areas or being laid off. Surely a shame, especially since the NASA folks I met were extremely impressive and passionate individuals -- real "top shelf" people. Another thought occured to me as we drove back to the hotel from the launch. For the first time in my life, my country does not have the ability to launch an astronaut into space. I've always felt that NASA and our space program represented the high water mark for America -- especially the Apollo missions. Of course the Shuttle program cannot last forever, but the problem is there is nothing to take its place. And so, if we want to put an astronaut in space we have to ask the Russians. So who won the space race afterall? I try not to get political in my postings here, so I will stop before I rant. Instead, I'll just say a big THANKS to all the folks at NASA for their great work and great hospitality. It was a fantastic experience! 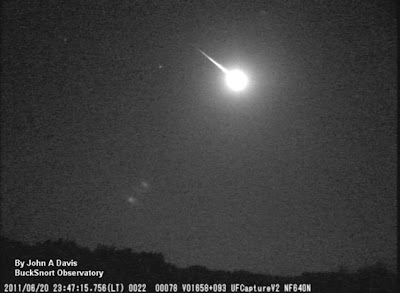 Last night (11:47 pm, June 20, 2011) I caught a HUGE fireball on my meteor camera at BuckSnort Observatory in Central Texas. This was certainly the biggest meteor I have captured so far. The video sequence was captured using a Watec video camera, f/0.8 lens, and UFOCapture software. We had clear skies on the Saturday night before TSP officially began, so I took the opportunity to revisit a favorite location -- the VLBA Radio Telescope just a few hundred yards from where Kim and I were staying at the Sproul Ranch. This year I chose to try a 3 panel panorama with the Milky Way arching to the dish (like a galactic rainbow leading to the pot-o-gold). This was shot with my Nikon D700, 12-24mm lens, on a tripod. Each 3 exposures were 45 seconds, then stitched together using Photomerge in CS5. 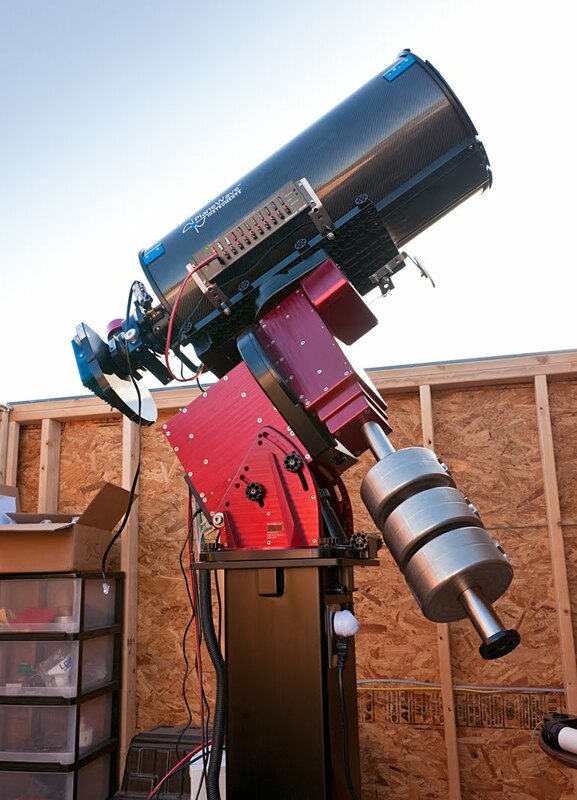 I went to the Texas Star Party last week and once again had a great time. The only thing missing were the stars! We only had 2 clear nights out of the week, but we did have wildfires (and thankfully no one was hurt). This made for some interesting photo opportunities. 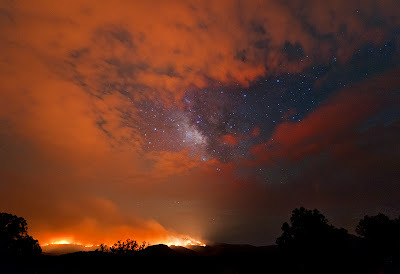 I went out late one night with my buddy Vance and I shot the Milky Way as it appeared through a hole in the smoke and clouds. The next night the fires were still burning (and even larger) and I took Kim up into the mountains to see the flames. 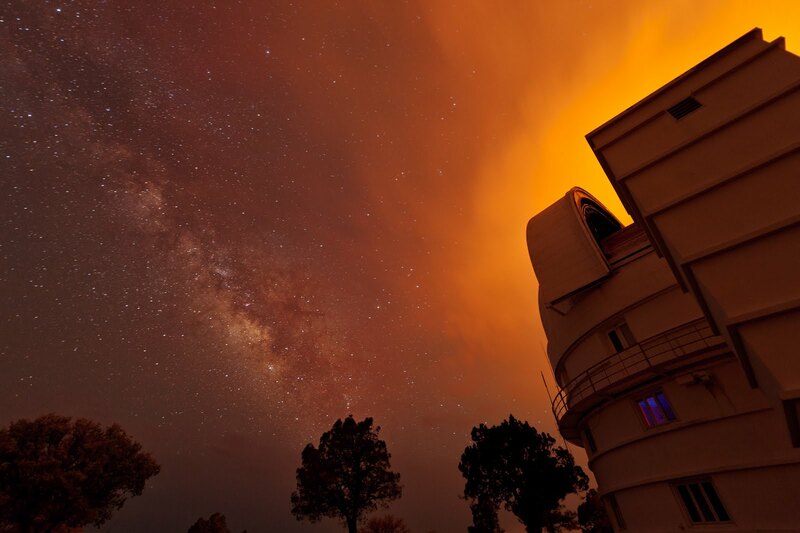 We made our way up to the top of the McDonald observatory and I was surprised to see the shutter open on the 107" dome and the astronomers still hard at work -- the fire was only about 3 miles away! I know, I know... I've lately been taking more photos of gear than of the sky, but I am hoping my work now will pay off in LOTS of image data later! 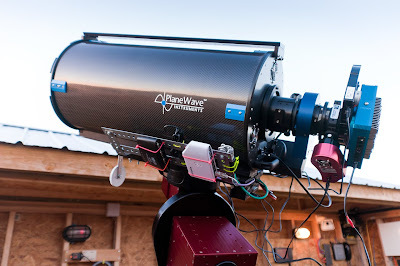 So THIS is a milestone -- my buddy Phil finally brought his new PlaneWave 12.5" CDK scope, Optec 3" focuser, and Apogee U16 camera down to my BuckSnort Observatory last weekend. 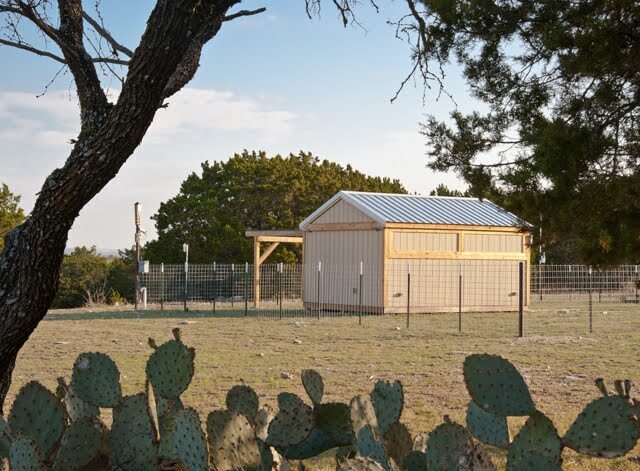 When Phil learned I was building an observatory and intended to operate it remotely, he asked if I was interested in having a partner. 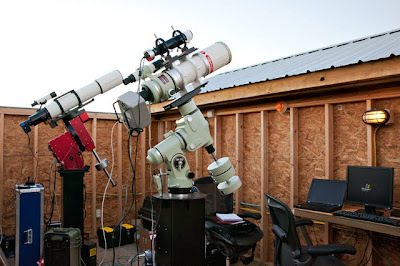 When he proposed selling a bunch of his gear and buying this scope for the observatory, the offer was too good to pass up (besides, Phil is a great guy and I knew we'd have fun). Anyway, we still have some minor issues to fix before it is fully operational (like adding more counterweight, replacing a bad USB hub, etc. ), but we tested it on Friday night and it did great! We were both very excited. 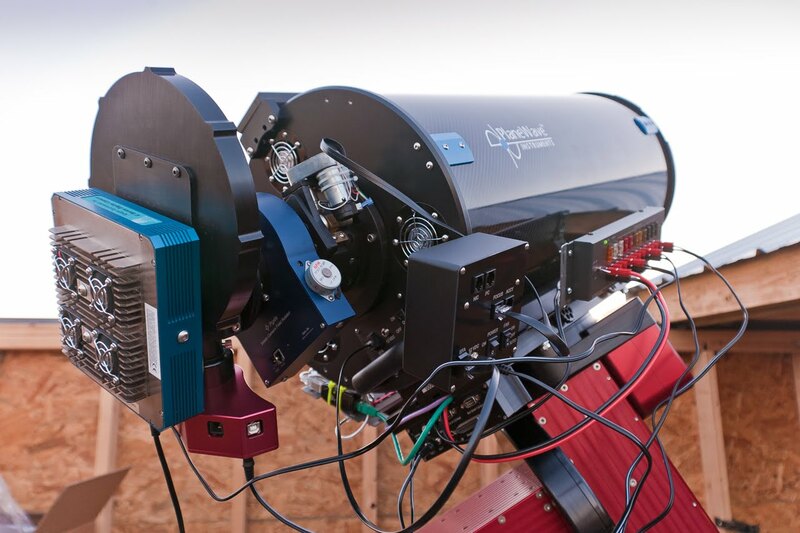 This scope will allow me to image much smaller targets at great resolution (galaxies, planetary nebulae, small reflection nebulae, etc.) than I currently can with my "wide field" rigs . The available target list now goes way up. 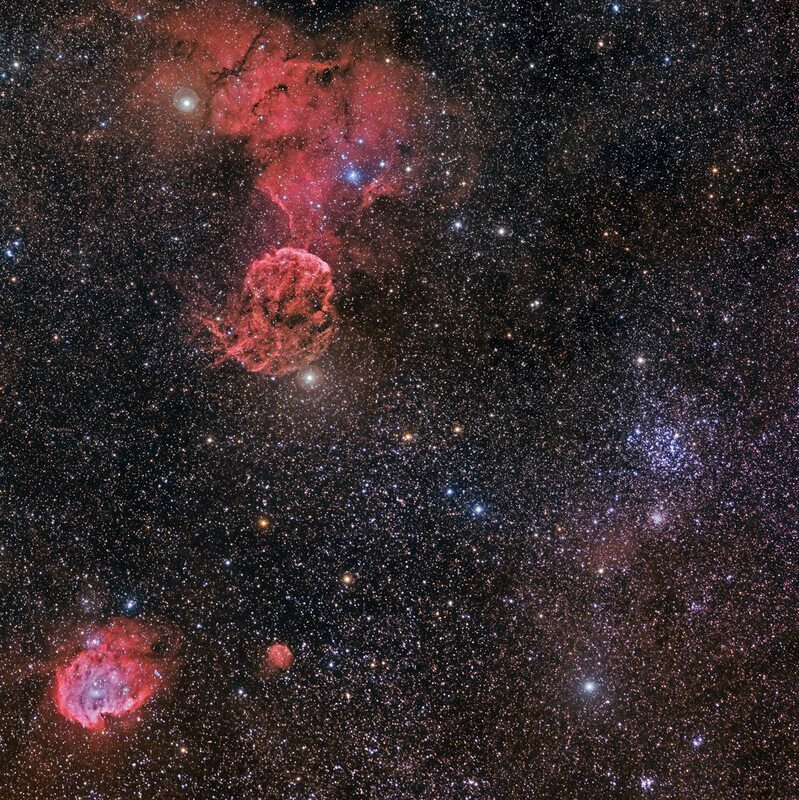 I shot a 2 panel mosaic of the Jellyfish Nebula, the Monkey Head Nebula, and M35. Doesn't "M35" sound kind of pedestrian after monkeys and Jellyfish? 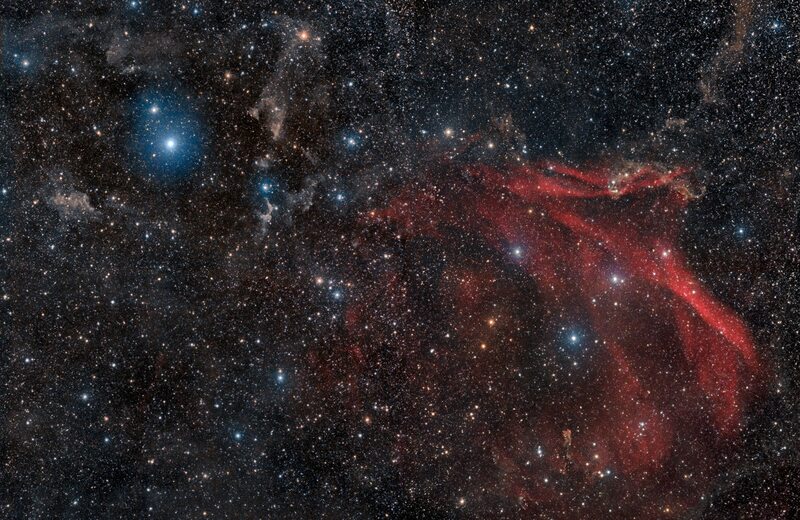 The large red nebulous regions are Hydrogen gas that is being excited by nearby stars and glowing red (like a red neon sign). The blue stars of open cluster M35 provide a nice contrast methinks. Kim and I went to Vegas last week, so we took the opportunity to revisit the Valley of Fire state park. This park holds a special place for us because it is where Kim proposed to me 17 years ago (she used to complain "why must the guy always propose? ", so I jokingly told her "fine I'm not going to, it is up to you!"). 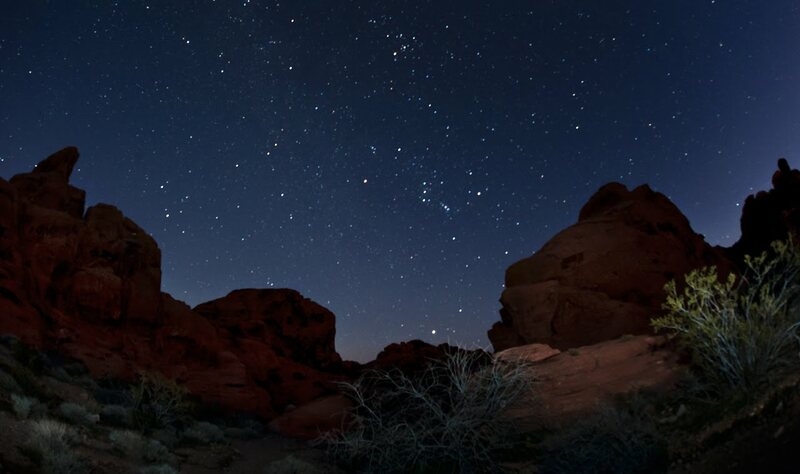 I had about an hour after sunset before we needed to head back to town -- just enough time to catch Orion peaking up over the rocks. This is kind of an experiment. I purposely left the focus slightly soft to bloom the constellation stars a bit (focused past infinity). Unfortunately, it also made the foreground slightly soft. But still, I think it is kinda cool. I was also experimenting with a flash -- firing 2-3 bursts to illuminate the foreground and distant rocks (there was no moon yet). We are planning a driving trip out west and I intend to do a lot of night landscape shooting, so I am just trying some different stuff. 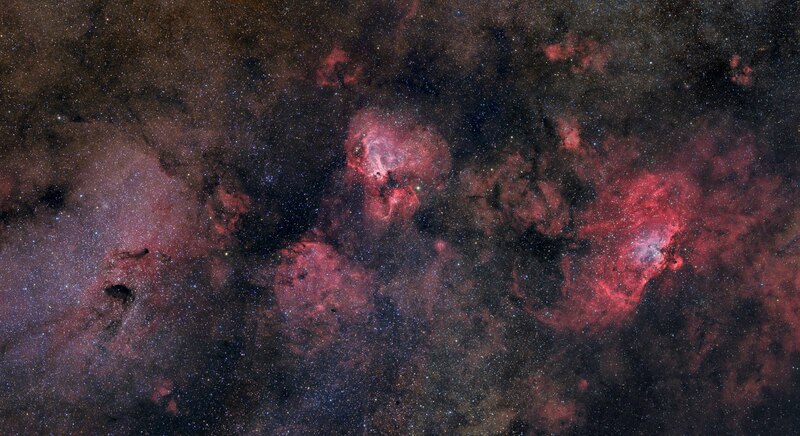 I think next time I will use good focus and add a soft filter to bloom the brighter stars. 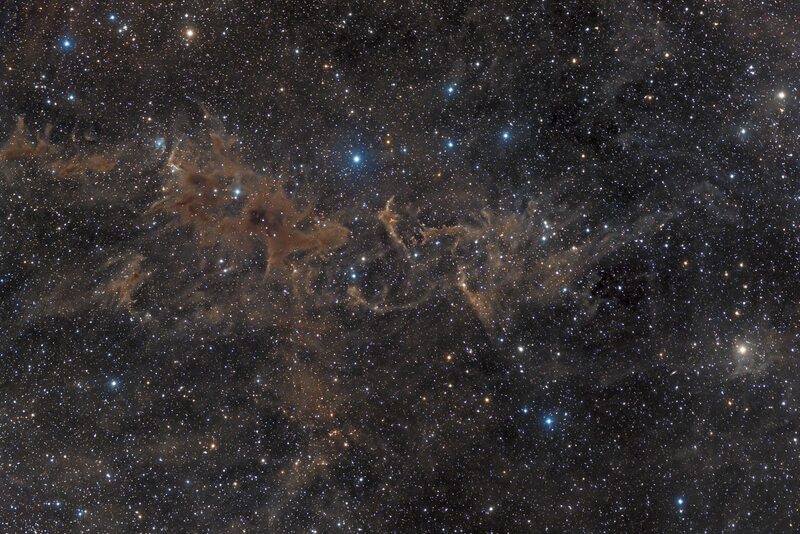 This dusty nebula is very seldom imaged. In fact, I could find no other examples on the internet (except for extremely wide shots that encompass the entire Orion/Eridanus area -- where this object shows as a tiny patch). I have always noticed this nebula, being just west of the famous Witch Head, so last week I decided to see what it would look like up close. I could not find any catalog number for the nebula, so this object was a bit of a mystery to me. And when I saw the results, I was quite amused at the "?" shape -- so I call this the Riddler (as suggested to me by my pal Dave Pearson). After posting this image, a fellow astrophotographer finally alerted me to the catalog name of this object. 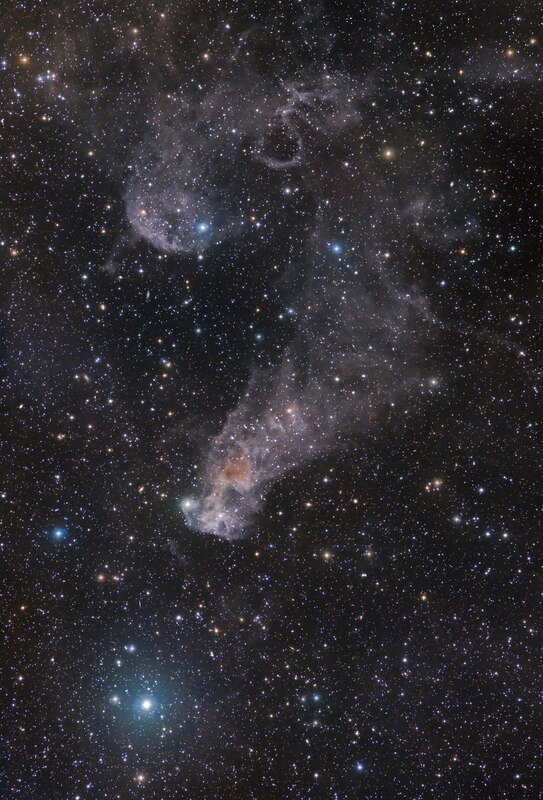 It is found in the Lynd's Bright Nebula catalog. It is actually 2 different nebulae -- LBN917 (bottom) and LBN906 (top).